Coral is massively dying everywhere in the Pacific Ocean. This is what the science expedition aboard the Tara is discovering since its launch in may last year. The Schooner continues its long journey. So far, it has sailed nearly 50 000 km and the scientific crew on board has gathered 15 000 samples of coral. Their main objective is to study the progression of coral bleaching around the Pacific Ocean, especially in areas where demographics and pollution are low. In Micronesia, Tuvalu and Kiribati islands, parts of the reef were already dead when the Tara got there. These islands and their inhabitants are really unlucky, being even more violently impacted by another consequence of climate change: sea-level rise. If the weather trend doesn’t reverse soon, in the next decades, they might disappear under the waves first, and then be forced to exile. We covered the near future consequences of this rising disaster for Kiribati here and for Tuvalu here. A least, reefs of Wallis and Futuna Islands have been relatively preserved. Because these areas are quite isolated from massive human activity, coral bleaching there can only be explained by climate change and warmer temperatures. Coral studies have shown in the past how an elevation of temperature breaks the symbiotic relationship between the polyp and its hosted microscopic algae, thus killing the living “skin” of the coral and revealing its white “skeleton”, which is the “hard” part of reefs, built layers after layers since eons by these humble animals. This might not look so serious at first, however it reveals how the small elevation of temperature is already triggering planetary disruption in oceans, undermining the basis of most ecosystems. 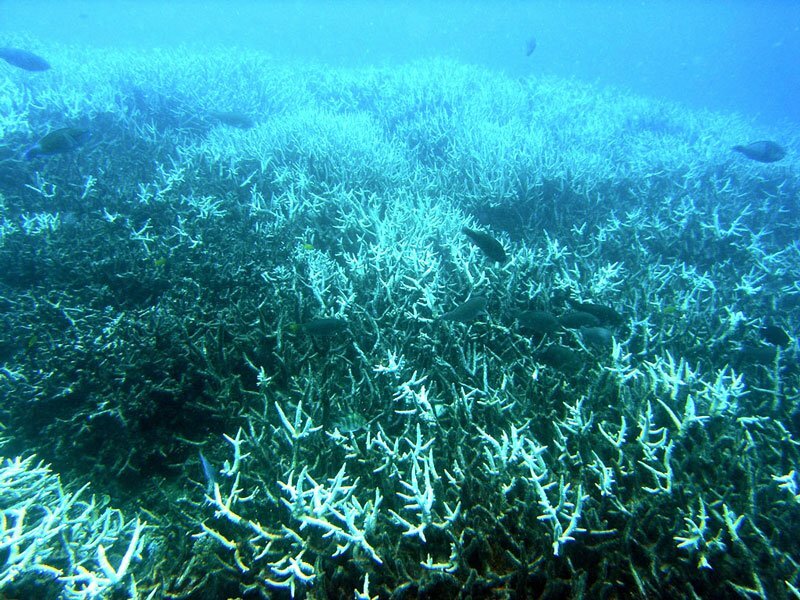 For instance, when coral bleaches in some area, all marine life disappears quickly, leaving bare underwater deserts, where for millions of years before, it was blossoming with rich fauna, sometimes endemic. It is clearly visible in some specific places when you snorkel around our island, Tahiti. Three decades ago, I remember spots in some lagoons here which were full of colorful underwater life: shellfish, fishes, corals, algae, mollusks of all sorts. Now, when you dive there, it looks like underwater death valleys. Life has vanished, and we fear that it won’t come back anytime soon. Fortunately, studies like the one in progress on the Tara, even so humble, can help in the long run to clearly reveal the irresponsibility of some of our worst habits and hopefully counter climate change.